An MP is to officially open a newly revamped £11m bus station on Tyneside. The Parliamentary Under Secretary of State for Transport, Gillian Merron, will unveil a plaque at Eldon Square Bus Station, Newcastle, on Tuesday. Newcastle City Council said the new station will offer passengers a modern, comfortable waiting area with automatic doors and air conditioning. The new station is on Prudhoe Street and replaces the underground concourse off Percy Street. As well as an extensive CCTV camera network and regular security patrols, the station also boasts artwork by glass artist Dan Savage. 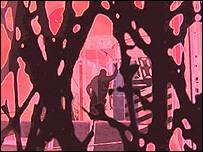 He has produced 19 glass bay screens, screen-printed with enamels in blue, deep pink and black. The designs are based on the hustle and bustle of a busy city. Council leader John Shipley said: "The new bus station will provide a first-class waiting area for passengers, greatly improving the comfort and convenience of travelling by bus."